By what Means are the Questions Selected? As per the filter properties you have set using the test blueprint panel, the Question Paper Generator randomly selects the set number of questions from the question bank. How can we Set the Test Parameters? Use the Question Bank Panel to define the test properties. Put a check mark on the filters of units, chapters, topics, difficulty level, class, and the type of test (numerical, theory, diagram, high order mapping etc), to direct the software into locating the desired question bank. 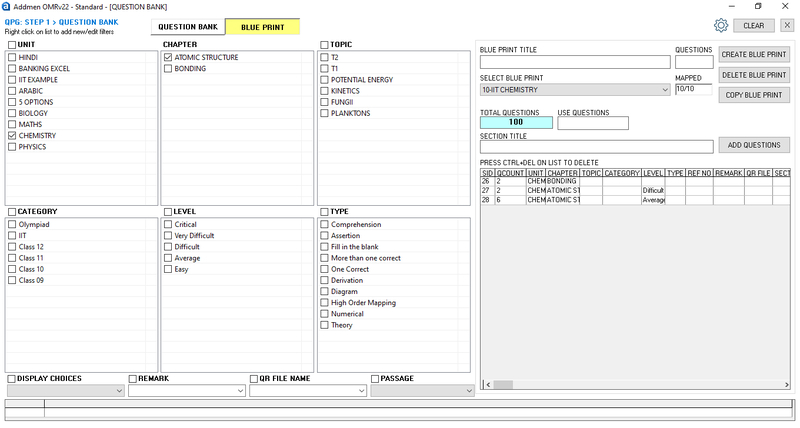 The question shuffling tool then displays the total number of questions available in the question bank for selection. Set the number of questions to be randomly selected and off you go. How Many Test Blueprints can be Created in the Database? You can create as many test blueprints and Question Papers as you require and save them in the library for later use. Each question paper generated will be adequately different from the other. How can we Avoid Overuse or Underuse of Questions? The chance for a question to be frequently used or neglected during the selection process is absolutely zero. The question shuffling software is customized to target the least used questions for the next selection, so there is no scope for the questions to be overused or underused. The software also allows you to manually include or exclude any number of questions in your current selection. How Many Variations of One Question Paper can I Create? You can use the question paper shuffling software to create multiple sets of one test paper.